» Higher Base Salary Vs. Bonus: Which Is Better And Why? Higher Base Salary Vs. Bonus: Which Is Better And Why? There are many opportunities to negotiate a new salary structure. You get a chance to do this every time you change companies, and also when you change roles within your company or decide to ask for a promotion or ask for a raise at work. 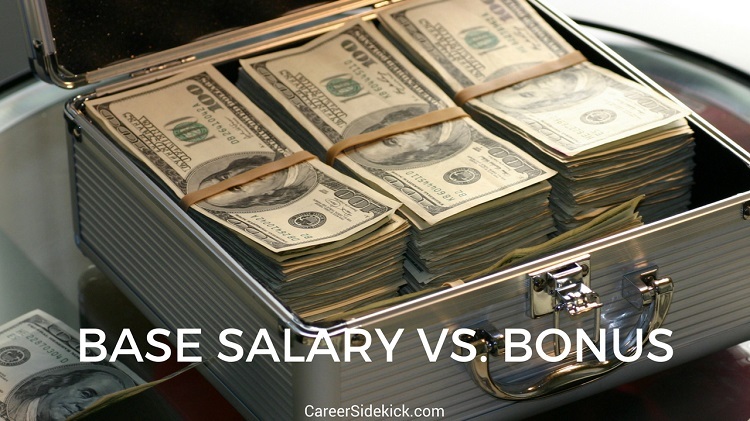 So what should you focus on… a higher base salary or bonus? I’m going to walk you through the base salary vs. bonus debate, step-by-step so you’ll know exactly what to do the next time you negotiate. Higher Base Salary Vs. Bonus – Which Is Better? I’ll make it easy… In almost all cases, base salary trumps other types of compensation in terms of long term importance and value. If in doubt, always negotiate for an increase in base salary above all else. Having a higher base salary will also improve your bonus in most companies. This doesn’t work in reverse: negotiating for a better bonus structure will do absolutely nothing for your base salary. Job titles vary from company to company. So do bonuses. Some companies have stock options but no cash bonus. Sometimes it’s the opposite. Sometimes it’s a combination and both are lower, but together it’s fair. Because of all this variation, hiring managers and recruiters often use base salary to determine your level when comparing you to peers within your industry. Every month as a recruiter, I see at least one job candidate miss out on an interview because they were deemed too junior for a position due to their current base salary. It’s a shame, and not fair, but it happens. Their resume was fine. Their amount of experience was fine. But the hiring team still felt the candidate must be lacking something if they’re only making X amount at their current company. Here’s what it comes down to: When you talk to a new company, instead of the hiring manager spending hours trying to figure out the intricate details and differences between your current compensation package and his/her company’s compensation package, they’ll just look at A) your base salary, and B) your total compensation. Companies have predefined salary bands that are used as general guidelines, but there is usually some room for negotiation. It’s less common for a company to be flexible when it comes to bonuses and other incentives. All the hard work and time spent negotiating for a better bonus at your current company might not translate into anything at future jobs. They often have a standard bonus, and that’s what you get. I see this happen frequently with vacation time as well. Most companies don’t care if you negotiated for 5 weeks of vacation in your last position; you’re going back down to 2 or 3 weeks like everyone else if you accept the new job. Anyway, back to my point… If you negotiate for base salary, you can continue to build on this in every new job offer. Continuing to go upward. And as mentioned in point #1, this WILL increase your bonus indirectly, as long as your bonus is a percentage. If everyone else in the company gets 10%, 20%, or whatever it is, you’re not going to get 27%. So stick to base salary. Get everything you can in base salary, and then negotiate other pieces like stock options, cash bonus, vacation time, etc. Think of those as a secondary objective, but don’t ever give up base salary if you can help it.